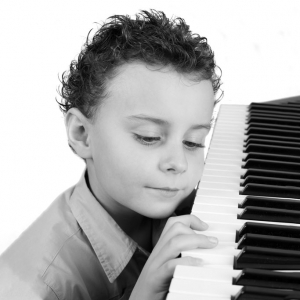 My Little Conservatory offers private piano lessons for children ages 4 through 9. The cornerstone of our teaching is to spark an appreciation of music that will grow and flourish throughout your child’s life. During these weekly lessons, your child will meet one-on-one with their supportive and encouraging instructor to develop their musical skills. Lessons are musically multi-faceted to engage your child’s imagination. Intended to accommodate your child’s attention span, lessons for children ages 4 to 6 are 20 minutes and 30 minutes for those 6 to 9 years of age. These 20-minute introductory classes provide your beginning pianist with an imaginative, entertaining experience. We engage your child using the groundbreaking Music for Little Mozart’s curriculum to instill fundamental skills as well as to ignite a passion for music. The centerpiece of each private lesson is a blend of technique, musicianship, listening skills, singing, and musical games. 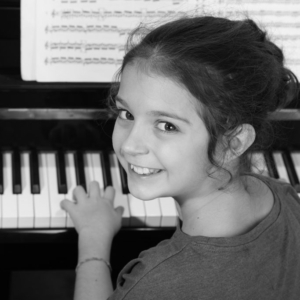 With multiple age-appropriate levels, our Piano Lessons for the Young Child are artfully designed to build a bridge between musical discipline and the sheer enjoyment of making music. Interested? Either call (408) 634-4087 or email and we’ll find the perfect spot for you! Our nurturing, skilled instructor customizes each 30-minute lesson to the age and aptitude of your child, be that beginner, intermediate, or advanced. Applying Alfred’s Prep Course for students ages 6-7 and Alfred’s Basic Piano Course for 7-9 year-olds, your child will cultivate their proficiency in piano technique and theory, musically-oriented games, and acoustic instruction. A variety of musical genres including classical, folk, and pop keep your student captivated and intrigued. We invite you to learn more about My Little Conservatory and discover if your child is ready for piano lessons. Receive $10 off your first month’s tuition or a free lollipop drum if you enroll your child on the day of your assessment.